Impress and refuel your guests with the Bluestone Lane coffee treatment! Committed to offering premium coffee experiences beyond the Bluestone Lane coffee shops and cafés, we take our signature food and beverages offsite, and customize a mobile coffee bar to suit you. Perfect for your corporate event, conference or large group gathering, our team will operate at your venue with a La Marzocco Linea Mini Espresso machine, and a professional barista to match! From a group of 50 to a group of 5,000, our team will activate for your brand in any capacity. The full range of Bluestone Lane espresso, hot and cold brew coffee, wellness drinks, tea and cold-pressed juices are available, as well as light bites, pastries and our signature avo smash. Looking to show off your brand? We offer the option to personalize coffee cups, napkins, and coffee stencils, so that you can captivate your guests with a custom, branded experience. 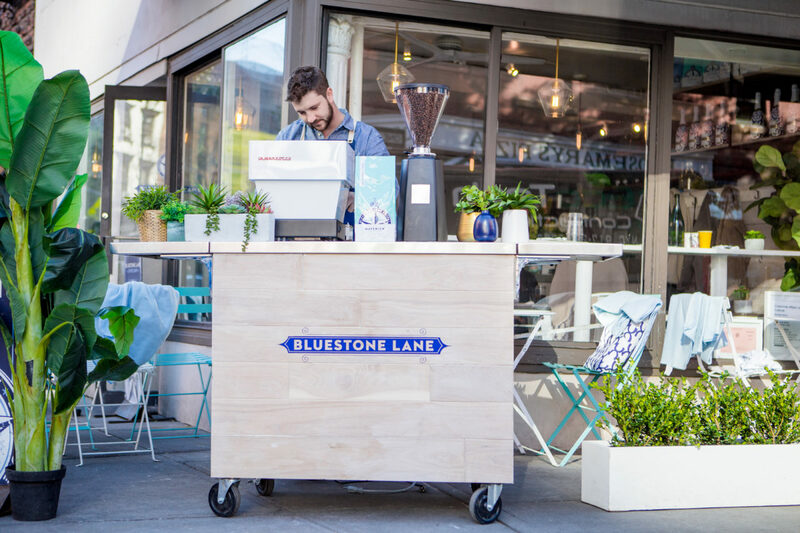 For a more elevated activation, we offer exclusive hire of our Bluestone Lane Coffee Carts! Wrap the exterior in your branding for a premium experience, tailored to you. Are you interested in hosting your next event with Bluestone Lane? Please note, this is not a reservations form but our events team will be in contact shortly to help you with your enquiry.